These days, most suppliers can give you next-day turnaround on your bar order. It is recommended that you place orders for delivery of perishable goods, such as meat and produce, twice a week, once on Tuesday and once on Thursday. You should be able to order liquor once a week. Because your business levels increase over the weekend, your Thursday orders are larger than your Tuesday orders. Require deliveries before 10 a.m. or between 3 and 4 p.m. Refuse deliveries at any other time because with a bar full of customers, you can’t accurately check in your order. You’re the buyer; you make the rules. Only time can prepare you for determining the quantities you need. This is a guessing game until you have experience and are in business for two or three months. Keep your eye on your inventory. Only a few people should have the power to spend money on behalf of your bar. But your bartenders, cooks, and servers will use the actual products more than you will and may know when you need something before you do. Use requisition sheets to give them a written way to communicate ordering information to you. Requisition sheets are kind of like purchasing orders (Pos), but they can be less formal. Take a look at the requisition sheet for an example. 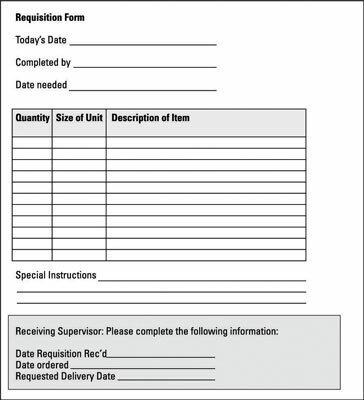 Any form that you use to track requests for supplies can be a requisition sheet. Your bartender can use a copy of the beer menu to identify needed stock, for example. Whatever system you use, make sure that it’s a written system, understood by everyone involved. (We don’t recommend a collection of sticky notes hanging by the telephone.) A written system provides an excellent way to communicate requests and start a paper trail for your supplies. And make sure your employees sign and date the request, so the purchaser knows how old the request is and whom to talk to if he has questions about the order. Credit: Sample requisition sheet.© John Wiley & Sons, Inc. When a delivery truck pulls up at your door, check in everything immediately, before the driver leaves your building. Your receiver (the person from your bar who is checking products in) should have a PO to compare the invoice (a form that the supplier sends with the goods that lists the items, quantities, and prices) and products against. The receiver and the delivery driver both should sign for the shipment. Use whatever tools are necessary to make sure you get what you intended to order. (it is recommended written tools like purchase orders and requisition forms.) You can’t assume that the process will work on autopilot. You have to steer it. More often than not, no one’s trying to cheat anyone out of what she ordered. Instead, mistakes are made and are truly accidental. Mistakes happen on both ends of the telephone. Don’t just assume that your supplier is at fault. Double-check your documents to confirm that you didn’t order the wrong stuff. When trouble occurs, how do you resolve it? Get on the phone ASAP to your sales rep. Often, she can personally resolve a problem for you, even bringing you the missing product. If you have the right products but are charged the wrong prices, you still want to let her know right away, so she can get your billing straightened out.